I don't know if anyone else is currently besieged by Asian lady beetles, but I sure am. The ladybugs have invaded my apartment building. And rather than sit around and complain about the bugs, I decided to take inspiration from them and come up with a bug-themed storytime. 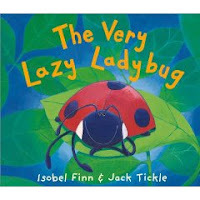 The Very Lazy Ladybug by Isobel Finn, illustrated by Jack Tickle. This ladybug is so lazy that she never learned to fly. Instead, she tries to hitch a ride with various passing animals. When the elephant sneezes it launches the ladybug into the air and she's forced to fly at last. Big, bright pictures of animals are pretty much always a hit at storytime. Of course, we can't forget The Very Hungry Caterpillar by Eric Carle. This classic will be familiar to many kids at your storytime. The book is great, but try creating a felt story or use this storytelling kit or puppet set from Lakeshore Learning to give it some extra oomph. If you've got older preschoolers or lower elementary, pull out one of my all-time favorites: Two Bad Ants by Chris Van Allsburg. It's a bit lengthy, so make sure you know your group if you're trying it with preschoolers. When the ant colony finds a way into the sugar bowl, two bad ants decide to stay behind and keep all the crystals for themselves. But life outside the colony isn't nearly as easy as they think it will be. Aaaarrgghh! Spider! 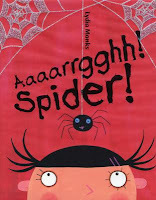 by Lydia Monks is technically not about insects, but this story of a sweet spider who just wants to be a family pet. No matter how hard she tries to show the humans what a great, talented pet she'll be, they always react the same way: "Aaaarrgghh! Spider!" What will it take for her to show them she'd be a great addition to the family? This is another one of my favorites and I can read it again and again. Add some music to your storytime with The Ants Go Marching and The Eensy Weensy Spider. Sing it straight up or check out Sharon, Lois, & Bram's version on their CD Great Big Hits. They start with the eensy weensy spider and then do a verse with the GREAT BIG SPIDER and then a verse with the itsy bitsy (very, very small) spider. There you have some of my favorite bug books... what are some of yours?? For spider storytimes, I also like to do Eric Carle's The Very Busy Spider as a draw-and-tell with puppets (the web gets bigger each time you say, "she was very busy spinning her web") and Raffi's song "Spider on the Floor." I have been trying to remember that book Argh Spider for over a year! They read it at storytime and I have been looking for it. I am excited you posted it!